This page documents the new items added by the Knights of the Nine official plug-in. For all of the possible armor items, there is both a heavy armor and a light armor version. The type of armor you will get is determined during the quest The Shrine of the Crusader and is dependent on your armor skills at that time. A character with higher Heavy Armor skill level than Light Armor skill level will get the heavy armor version of all items; a character with higher light armor skill level will get the light armor version of all items. In the event both of your armor skills are equal you will get the heavy version. These relics (both armor and weapons) can be equipped only if the player's Infamy remains at 1 or less. This restriction remains in place even after the entire Knights of the Nine quest line is completed. (The only exception is if you duplicate the Relics). "Beware! The gods have taken note of your crimes! Do not continue down this path or you will be unfit to wield the Crusader's Relics." 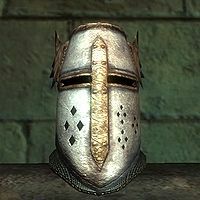 "Your crimes have made you unfit to wield the Crusader's Relics. Walk the Pilgrim's Way to repent of your sins and once again seek the favor of the gods." Any Crusader's Relics that you had equipped will be automatically unequipped; an attempt to re-equip them will cause a similar warning to appear. You must redo the Pilgrimage in order to be able to clear your infamy. Equipping all six pieces of armor grants the player the ability Holy Aura which includes Shield 5pts on Self and Umaril's Bane. Umaril's Bane effectively weakens Umaril, reducing his Agility, Luck, and Strength attributes by 60 pts each and his Blade skill by 50 pts. The details of how this curse is implemented are somewhat odd. In reality Umaril's Bane is an empty scripted effect, included just to make an entry appear in the player's list of effects. A separate script enables the effect, and actually works in reverse: Umaril's base values of Agility, Luck, and Strength are all low (5 to 35, depending upon the player's level). Normally, these values are all fortified by 60 pts; Umaril's Bane turns off the ability that causes the values to be fortified. Another scripted side-effect of the Crusader's Relics is Crusader's Bane. If you hit Umaril with either the Mace of the Crusader or the Sword of the Crusader while in the physical plane (but not in the spiritual plane), Umaril is inflicted with a 5 second 83% Weakness to Fire. The 1-6 level heavy armor is equivalent to iron quality armor in weight and rating; the health is twice that of normal iron. The 7-10 level is generally equivalent to dwarven, but again with extra health. Similarly, 11-15 is generally orcish, 16-20 is ebony, and 21+ has daedric statistics. The Armor Stand in the room under the Priory of the Nine is actually much more than simply a display stand. Placing the Relics on it will recharge them, repair the items to 100% durability (even if they had been repaired to 125%, so you can use this as a free way of increasing your Armorer skill once you reach 75) and most importantly they convert the items into their level-appropriate variants, i.e. if you got the items at level 5, but are now level 25, placing them on the stand then removing them will mean you now have the level 21+ equivalents of the same items. 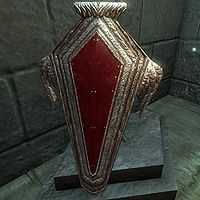 Despite being of Divine origin, Crusader's Relics cannot be given to Martin instead of Armor of Tiber Septim during the quest Blood of the Divines. 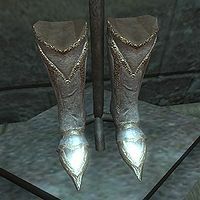 The Boots of the Crusader (also known as the Boots of Kynareth) are obtained from Kynareth's Grotto during the quest Nature's Fury. Equipping these boots also grants the player the ability Woodland Grace (which makes the player a member of the hidden "NDPredators" faction, with a rank of 0, "One With Nature"). This effectively means that most natural creatures (specifically Wolf, Black Bear, Brown Bear, Boar, Timber Wolf, and Mountain Lion) will not attack you. Only natural animals, not monsters, are affected by the boots. You can still attack any animals; when attacking a creature affected by Woodland Grace, it will become hostile after the first hit (unlike summoned creatures, which require 3 hits). Also, they will unfortunately still attack your horse (although not Shadowmere), so you must still be wary of wild animals while riding through Tamriel. If while wearing the boots you come into the sight of a natural creature and remove the boots the creature will immediately become hostile. Putting the boots back on will not restore the animal to a non-hostile state. The heavy armor version of these boots has a minor bug: instead of always receiving the best boots for your level, there is a 50% chance of receiving the boots from one level lower. For example, high level (>20) characters have a 50% chance of receiving the level 16-20 version of the boots, and a 50% chance of receiving the correct level 21+ version of the boots. This bug affects the boots both when you first acquire them and also later if you use the Armor Stand to repair the boots or increase their level. Once you have the Armor Stand, it can be fixed by repeatedly putting the boots back on the stand and retrieving them until you receive the correct version for your level. This bug does not affect the light armor version of the boots. Obtained from Priory of the Nine during the quest Priory of the Nine. 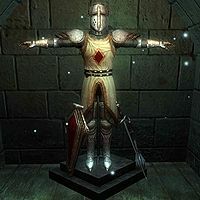 † This bug is fixed by the Unofficial Oblivion DLC Patches. Obtained from the Chapel of Stendarr in Chorrol during the quest Stendarr's Mercy. Equipping the Gauntlets also grants the player the ability to cast the lesser power Merciful Touch: Restore Health 50 pts on touch for a base Magicka cost of 25 (instead of 149). Obtained from Lathon during the quest The Faithful Squire. 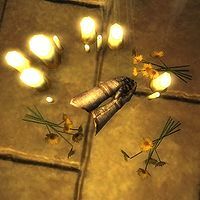 Equipping the greaves also grants the player the ability to cast the lesser power Blessing of the Eight: Shield 20% for 60 seconds on touch, for a magicka cost of 25 (instead of 124). * This version of the greaves accidentally has the cuirass' enchantment. Obtained from Vanua during the quest The Shrine of the Crusader. Equipping the Helmet also grants the player the ability to cast the lesser power Serene Beauty: Calm up to Level 25 for 10 seconds on touch, for a base magicka cost of 25 (instead of 170). 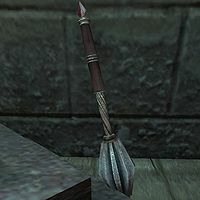 The Mace of the Crusader (also known as the Mace of Zenithar) is obtained from Leyawiin's Chapel of Zenithar during the quest The Path of the Righteous. Equipping this mace also grants the player the constant 10 point Fortify Blunt ability, the Crusader's Arm. Obtained from Fort Bulwark during the quest Wisdom of the Ages. Obtained after reconsecrating the sword in Cheydinhal's Chapel of Arkay during The Sword of the Crusader. Equipping this sword also grants the player the constant 10 point Fortify Blade ability, the Crusader's Arm. Where two ID numbers are listed, the second one is the ID for the unconsecrated (cursed) version of the sword that you initially pick up. In addition to the effects listed below, you will also be afflicted with Stunted Magicka until the sword is reconsecrated. There are only five versions (instead of seven versions) of the cursed sword. If your infamy is at least 2 when you equip the sword, then the curse will not take effect. These battle axes are used by the Aurorans. They all look like Elven Battleaxes and have Speed=0.8, Reach=1.2. 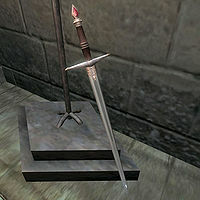 This sword can be obtained from Umaril the Unfeathered during the quest Umaril the Unfeathered. It is possible to retrieve two copies of it, one from killing Umaril in the physical plane and a second from killing him in the spiritual plane. The sword actually carried by Umaril has different statistics, but that version cannot be obtained by the player: the moment the player picks up the sword it is changed into one of the swords listed in this table. 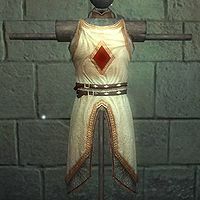 Knights of the Nine Cuirass Light Armor xx000EC9 9 240 90 7.5 Found in the Priory of the Nine and worn by your fellow knights. Knights of the Nine Shield Light Armor xx000EC8 3.6 180 45 9 Found in the Priory of the Nine and worn by your fellow knights.